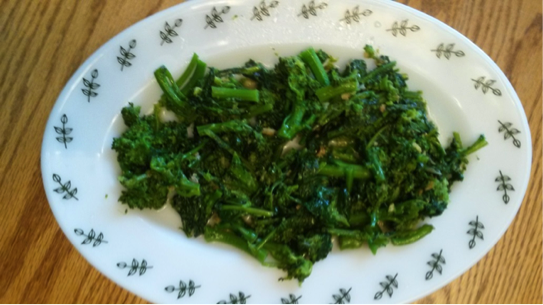 This easy to make delicious elegant vegetable is usually overlooked as a side dish. Cut the Broccoli Rabe into bite size pieces. Boil for 2-3 minutes until it is el dente. Strain it. In a skillet over medium heat add 1 Tbsp. of olive oil and 2 cloves of minced garlic. Stir the garlic for 30 seconds or until the garlic is aromatic and slightly brown. Add the Broccoli Rabe into the skillet and toss with a dash of salt.